Each issue of Small Boats Monthly includes two boat profiles, an adventure narrative, product reviews, a profile of a reader-built boat, and often a how-to. Each of these categories is described in detail below. Our boat profiles run about 1,500 words each, and these words are divided more or less equally among three broad areas: The intent of the design, the construction process, and the performance of the boat. Each profile must be informed by direct experience with the boat. Authors are generally asked to shoot their own photographs for these articles, unless extant images are available. Each year, a selection of these profiles is published in our annual newsstand-only anthology, Small Boats. Small Boats Monthly adventure narratives run 2,500 words. They are entertaining, compelling, and educational. They excite and thrill the reader, as well as inform and educate. We’re seeking style and substance in these articles—vivid descriptions of boats and the places they travel. We’re open to both offbeat locations and well-trodden water trails. Each adventure narrative must include several good images of the boat in which the trip is made. We may select a photo of the boat to illustrate a 300- to 400-word sidebar describing the design. These articles might also include a resource sidebar, which is to include a description of how to access the location; a description of launching and parking facilities; nearby suppliers, food markets and restaurants; camping; and whatever other services, unique to the area, might help in trip planning. We usually publish two product reviews per issue, and these run about 500 words each. Our review categories include books, gear, clothing, trailers, hardware (and software), and any other product imaginable that will lead to better small boating and shoreside camping. We offer do-it-yourself projects for the shop and interesting ways to make life easier afloat or at shore-side camps. Text should have no more than 500 words and be accompanied by a selection of photographs and, if appropriate, a short video clip. We occasionally use a collection of brief tips for a single Technique article. Each tip will be about 100 to 150 words, written by the editors using notes provided the contributor, and 1 to 3 photos. We pay $50 for each tip published. Photographs should be in jpg format and have a resolution of at least 2400 x 1800 pixels. Horizontal framing is preferred. Vertical shots add variety but don’t fit well in some placements. If you’re shooting with a smart phone, do not use the zoom. Phones use a digital zoom and that may make the subject appear larger on the screen, but it reduces the resolution making it likely that we won’t be able to use the photo. While not required, video takes advantage of our digital format. We don’t require clips shot with high-end video cameras; the movie setting on common digital cameras will often suffice. Use the highest resolution you have available and shoot clips in the range of 20 to 30 seconds. Erring on the long side—without creating large files—gives us more latitude for editing. If you pan, slow and steady is the goal. Don’t narrate unless there is good reason to. If explanations are required to clarify what we’re seeing, adding text is usually preferable. Be aware of the sounds being recorded: They should be appropriate for the scene. The text and images you submit must be original works not previously published in print or on the web, in whole or in part, or currently offered for publication elsewhere. When we’ve decided to publish your article, we’ll ask you to sign a copyright statement. This provides protection for you and grants us first world serial rights to your material. We pay upon acceptance at the rate of 30 cents per word. Published images, both stills and video, are paid for at the rate of $50 per image. Small Boats Monthly is part of a dual-platform publication, a digital companion to the print annual Small Boats. 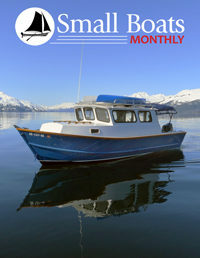 Articles published in Small Boats Monthly may also run, in part or in their entirety, in the Small Boats print annual, without additional payment. Our Reader-Built Boat section is modeled upon the hugely popular Launchings department of WoodenBoat magazine, but it has a unique focus: It features people as well as boats. We want to know about the boat, for sure, but we also want the story behind it. Was it built by a father-and-daughter team? By a group of retirees? A high-school class? We’re seeking diversity of boats as well as diversity of builders in these profiles. If you’ve launched a boat within the past year, please send: the boat’s name; its length and beam; the name of its design class or type; names of the designer, builder, owner, and photographer; the date of its launching; and the story behind the boat and the people associated with it. Don’t worry about sending polished text. We need only the information and we’ll take care of the writing. Reader-Built Boat profiles run 500 to 1000 words each, and are accompanied by at least two images—one of the boat and one of the builder(s). Please e-mail a half dozen or so photographs that offer different views of the boat. Videos aren’t required but strongly encouraged. Please don’t narrate as you shoot. We like to work with three or four clips, each around 20 to 30 seconds long. We’ll do the editing. We welcome all queries, and prefer that they be sent as succinct (300 words is about right) proposals with just a few image samples. Should we decide to pursue your idea, we’ll ask for a complete manuscript. If, however, your manuscript is already complete, send it along. We’re friendly people, and will be happy to bend the rules for a good story prospect. Please send all queries, by e-mail only, to Christopher Cunningham, Editor, at chris.cunningham@woodenboat.com.